Browse our products, adding lines to the Quotation Cart as you go. This is just like a shopping cart on any other website, but when you submit the cart we respond with a quotation Alternatively simply call or email us with your needs. If you are a regular OPAS customer you can register your address details etc. so you don't have to fill in the quotation form every time. 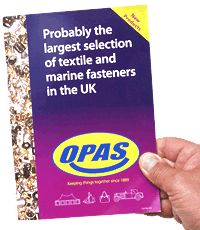 Buy from OPAS and you can enjoy expert technical advice; no matter what your fastening needs are, we are always ready to discuss the best solution. Copyright © 2015 OPAS (Southern) Ltd. All Rights Reserved.